If I was asked to point my favourite compositions written for percussion, this piece would be one of them. If there is a question about prefered composing style, I would be certainly sure that Georges Aperghis is amongst my beloved composers. In fact, it is not only about his music. Mr Aperghis is a fanastic persona and it was a great pleasure to work with him at the Impuls Academy 2013. This fact has a great impact on my development since then. I must mention, few years ago I was not really positive with Georges’ pieces, including “Graffitis”. But I know it was because I did not undrestand. I have started appreciating the quality of composition and performing side of it after working on his percussion trio “Les Guetteurs de Sons”. This musical language is special and brings extraordinary qualities. I like the idea of being restrained about the background story in order to keep spectator’s focus. Being convincing while performing has a different dimension this way. Spectator is the last cell of the performance and he should be able, and eager, to create his own scenario, so to speak. At one of my concerts in Copenhagen I was asked what sort of language am I speaking from the begining of the piece until the german-recitation part. This brought me to conclusion, that this part might not only be an onomatopeic declamation, but an artificial-babble-monologue almost with a meaning. As a matter of fact, we very often guess what is said by a person who speaks a language unknown to us. Or, at least, we know what feeling or meaning is hidden there. Don’t we? In my Debut program, “Graffitis” happened as the last piece before the break. It was also the last part of an intimate-performing-music segment. After “Mani. Gonxha” by Pierluigi Billone there was a marimba composition by Salvatore Sciarrino “Il legno e la parola”. Aperghis’ piece was there in order to introduce a bit of spice and humor after Billone’s prayer and Sciarrino’s very quiet and airy marimba music. A conclusion of this abstract segment of my show. A brother-piece to an earlier composition “Le corps a corps”. And in the same manner, percussionist is both the narrator of an epic story and the central character in the play. It reflects a fictional combat between musician, instruments and his own breath. The Goeathe’s “Faust” text is used here, for some reason (you may choose). So, it may be in the same way as graffiti on the public property; a metaphor of fight, of opposition, an expression of underlying social messages; or simply an artistic action. Just picture a long wall with writings and drawings from simple words to sophisticated art, and you studying them while passing by. 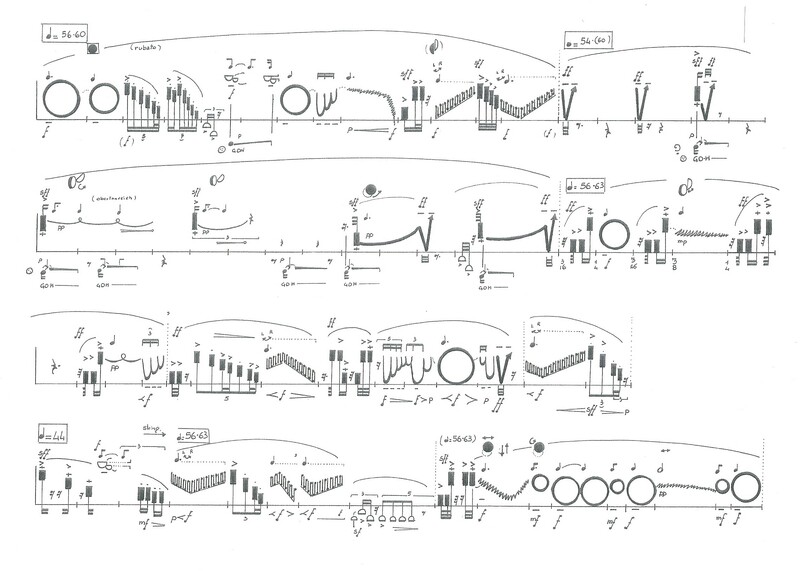 This piece is written for Gaston Sylvestre in 1981. This was a second piece in my Debut Concert, a Danish premiere, and I believe Scandinavian first performance as well. After Scratch Data by Raphael Cendo, which was an introduction to the show, here it started first bigger segment of my program. This segment was an intimate and performative part, centered around prayer, silence, air and voices. An inner and outer conversation. “Gonxha” is written like that not for fun, though it gives a lot of fun to work with it. 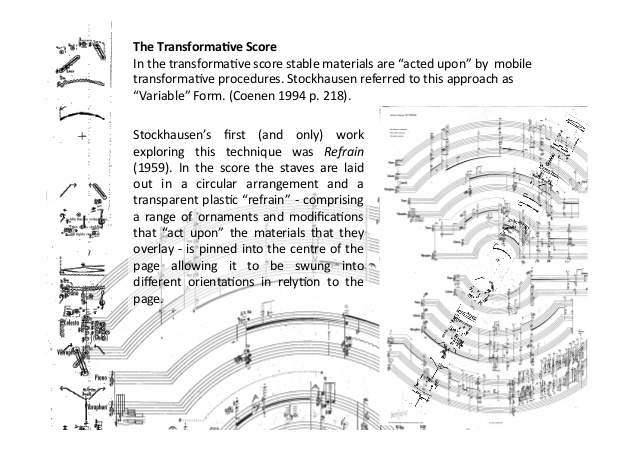 I have always preferred reading and playing from handwritten scores, or a special graphic systems. It makes me feel a better connection to the music. These small things that are sometimes not clear to understand give some space for interpretation and let me be more independent, observant and open. “Mani. Gonxha” (2012) is one of the “Mani-pieces” group in Billone’s catalogue. It’s a prayer. Succession of introverted and extraverted elements, mixing in order to establish an emotional balance. The action of two hands is crucial and a simple musical instrument is an extension, a connection. The score focuses on those manual actions. This music is composed for Christian Dierstein. Here they come. Video clips from my Debut Concert that happened on November 19th. This was a graduation recital that has concluded my Advanced Postgraduate studies in the Soloist Class at the Royal Danish Academy of Music in Copenhagen. This program took 2,5 year and was specially oriented in the solo performance in contemporary percussion music. For me it was also the last period of academic education in Denmark. My focus was first mostly on more standard repertoire, Danish music, due to my teacher Gert Mortensen, and on Stockhausen, which I found intellectually and musically a great source of inspiration, and also challenge that would equal my inclinations. From certain point, beginning of 2013, after the Impuls Academy in Graz, I have taken a step towards different direction, a style that is more connected to instrumental theater. I have partially re-evaluated my point of view, or rather diversified and opened my understanding of musician’s function and a process of creating the performance of a composed piece.